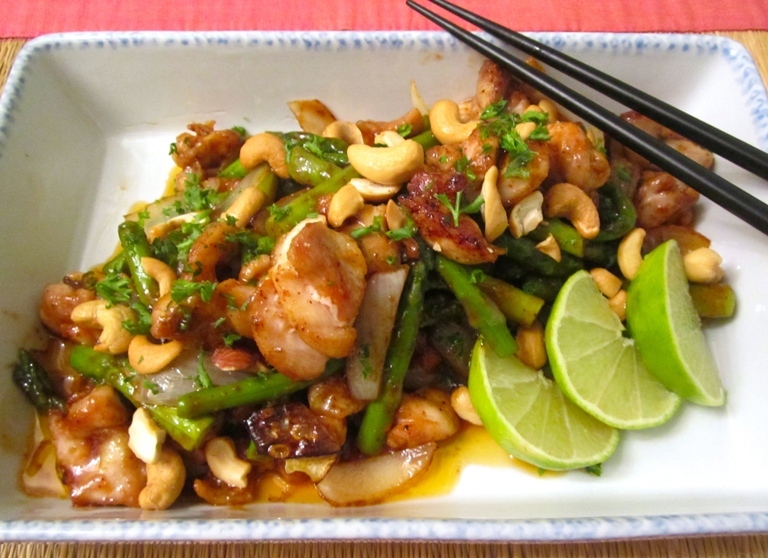 The Thai Stir Fried Chicken with Cashew Nuts recipe (gai phat met mamuang himmaphan) is full of flavor and scrumptious to eat. Prepare sauce by mixing together the purpose ingredients. Put the cooking oil in a wok. Heat oil in a wok over medium-high heat and wait for the oil to get hot. Then Stir-fry the chicken until it gets light golden-brown. Put it on the platter. Add oil and fry the cashew nuts until they turn light brown. Put it on the platter. Now fry onion, tomato, garlic and chilles medium heat in the wok until fragrant. Now put the fried chicken and cashew nuts in it and stir fry for 2 – 3 minutes. Finally, pour the prepared sauce in the wok and mix all together nicely. Turn off heat and let the wok cool for a moment. Now the dish is ready to serve it within a plate, garnish it with spring onion.